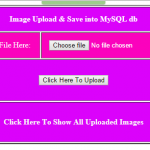 How to send image along with Text using JSON PHP and store image path in MySQL database. In this tutorial we are going to upload image on server using AsyncTask and doInBackground task. 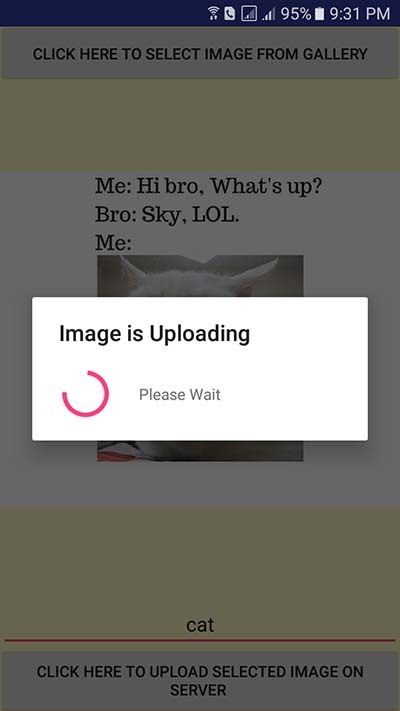 Sending image to server is very much typical for all the android developers so in this tutorial we are going to create an android application which will upload the selected image online directly to server. We will using PHP script to get and sending image and storing that image to folder and store the image name with its complete path into MySQL database. 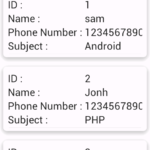 So here is the complete step by step tutorial for Android Select Image from Gallery Upload to Server example tutorial. We are creating a folder named as “images” on our online web hosting server and after that we will create a MySQL database and inside that database we will create a table named as “ImageUpload”. 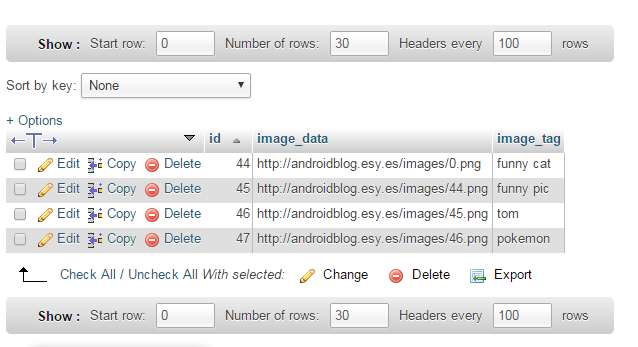 There are three Fields inside that table id, image_data and image_tag . After that we will create android code which will send the selected image to server. 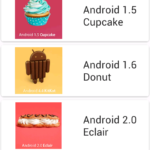 Android Select Image from Gallery Upload to Server example tutorial. 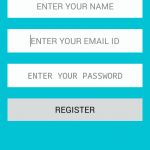 Please add INTERNET permissions and WRITE_EXTERNAL_STORAGE permission to your AndroidManifest.xml file. 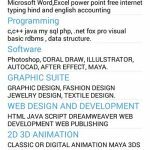 android:text="CLICK HERE TO SELECT IMAGE FROM GALLERY"
android:text="CLICK HERE TO UPLOAD SELECTED IMAGE ON SERVER "
Click here to download Android Select Image from Gallery Upload to Server example tutorial project with PHP files and MySQL database included. Sir Download link is Working Fine, i have checked it myself. Your php code is working fine when i upload image in localhost..
Raji just configure properly the server configuration file . wonderful upload, solved my proble, but when i upload image in .jpg format it does not upload , please help. How upload multi image selected to server? Dear Hamed, I have n’t try that now but regarding to your query i will soon upload a new tutorial. Benno currently i am working on this type of tutorial and soon i will upload new tutorial regarding to your query. Same to you Benno Merry Christmas . 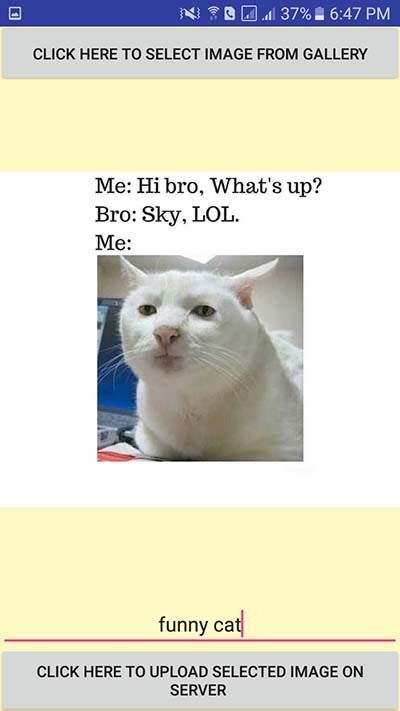 Can i wanna Contact you on Skype or any sozial network pls ? I have a question and need to talk private to you! will be cool, thx! Thx, sending a Email now! Replied You Benno check your mail box. data is not inserting into database.please help me..
tell me the error manjon . thanks sir, tutorial very helpful, but why the image upload getting corrupt. The size just in bytes, can you help me please? 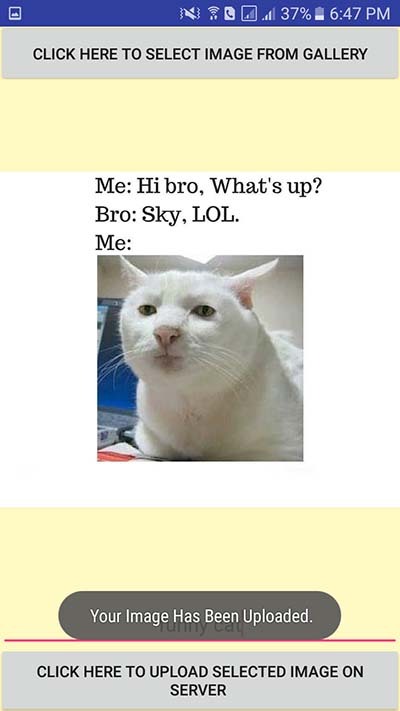 Sorry sir, i am wrong in php syntax, thanks for tutorial, very helpful. Sir, how i can upload large image > 30 Mb? or can we resize/compress image Android? Denny i have not try that yet maybe this script will also upload large size images. 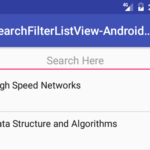 I have one question sir, How to upload any type of file(image,audio,text) into mysql database .is there any solution please..
yes manoj follow my this tutorial https://www.android-examples.com/open-file-manager-explorer-in-android-pick-any-file-programmatically/ to select any file from phone than using this code send the selected file on server with image uploading tutorial. Thanks sir , but how to save that any type of extension file into mysql database. Manoj the same php file will do your work . I have to upload image using async task but at the same tyme i have to add header through async task. please explain your question more briefly. How can I update an image uploaded with specific id ? I’m looking forward to your response sir . 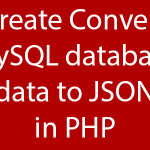 Caroline just use SQL update command on your server with php script and send the image id along with image to your server. Hello, this tutorial is veryhelpful to me. Nisa read my this tutorial for capture image from camera https://www.android-examples.com/capture-image-from-camera-and-display-in-imageview-android/ then by using both tutorials you could upload the captured image on server. thankyou 😀 now I can upload image from camera. Nisa just put a condition on button click that if(bitmap == null) then simply display a toast message. Hello, I want to ask for your help again Juned. Nisa there is no need to change the image size it should be automatically upload image as it is. But it’s too small, so when I try to view that image, I can’t see clearly what image is it. Is there any other way to resize that image? Nisa did you have change the code because when i have uploaded image using this code it has the same size . No, I haven’t change the code, I just added your code to my application code. Code received Nisa .. Checking the code. Hello juned, how about the code? have you found the mistakes? No nisa so far the code is working correctly . Thank u so much for the great tutorial………..
after running the app, when clicking the upload button, it uploads the image properly but whenever i try to upload another image it insert the mysql record properly but it upload the previously uploaded image and after restarting the app this process works fine for first time but it again upload previous image again. i have created a project and trying to pass text from a textview, edittext and a imageview but i am not able to insert these fields into database. I have removed the password for safety reasons. will pls check the code and tell me what wrong i am doing? Ok Advik i am checking your code. Aimal just download the whole project and import it into studio . Jose which internet connection is you using, because something because of slow net connectivity it will time out the upload season . carolina there is no need to convert MySQLi to MySQL which hosting server are you using ? Dimple you need to configure the database config file same as your server configuration. 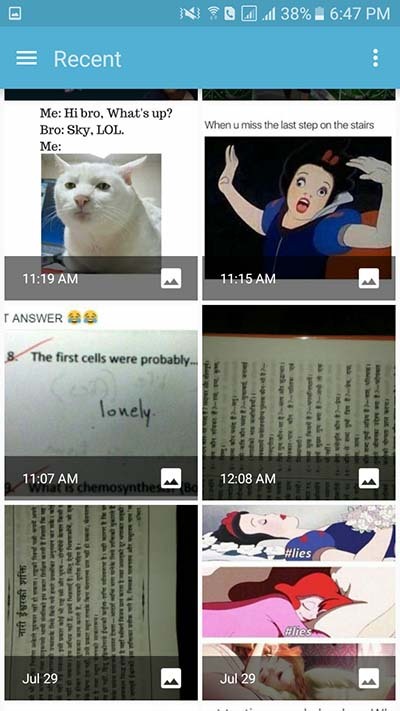 Sir can u give me some idea about how to upload multiple images in one activity at same time ??? Dimple i will currently working on this tutorial and Soon i will publish tutorial on this topic 🙂 . Dimple you need to declare ByteArrayOutputStream inside the UploadImageToServer() function. 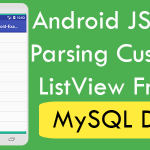 You can see my this tutorial on my another blog : https://androidjson.com/android-upload-image-server-using-php-mysql/ . What to do to solve this issue??? Dimple this would work on both cases please visit image upload tutorial on the link i have provided in comment. 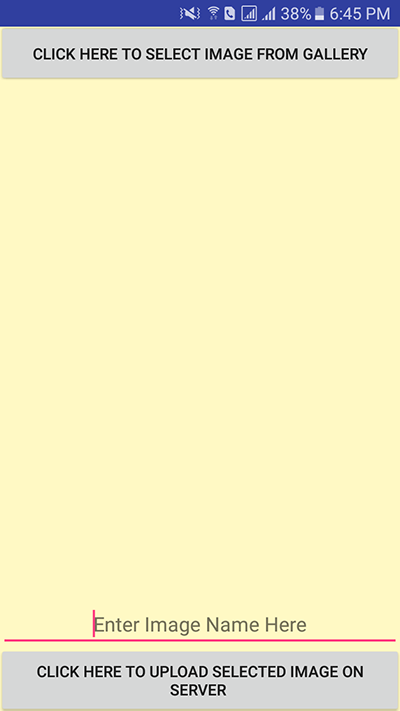 Your Image Has Been Uploaded. How to upload picture that has large size ?? Dimple using this tutorial you can upload 5MB size images if you have high speed network like 4g or 3g. Sir how can I upload mutiple texts and multiple images to the server? Divesh i will soon upload new tutorial regarding to your query 🙂 .